UNISON Kinneil Band were delighted to gain a podium place at the Fife Charities Band Association (FCBA) Open Brass Band contest which was held on Saturday 30th September 2017 in the Adam Smith Theatre in Kirkcaldy. This was the Kinneil Bands first contest working under the baton of our new resident conductor Chris Shanks and it proved to be a successful start to our partnership together. It was also a rather early start for the band as we were drawn number 4 from 17 bands but the early start proved fruitful as we were awarded 3rd place in the Open Competition. The playing programme consisted of the popular street march Ravenswood (William Rimmer), a beautiful hymn tune arrangement titled Prelude on ‘Lavenham’ (arr. Nobes) and the challenging test piece work of Philip Sparke’s Dances and Alleluias. 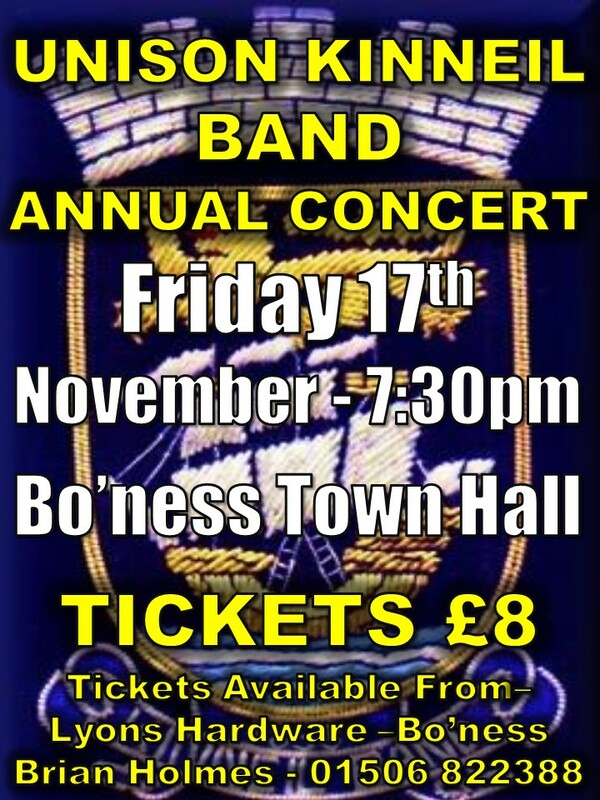 Next up for the band is the eagerly awaited Annual Concert which is being held on Friday 17th November in Bo’ness Town Hall. 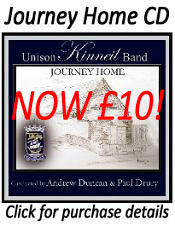 UNISON Kinneil Band are looking to fill a few gaps within our band after our summer holiday break. If you want to join a hard working but very friendly and ambitious band, then please get in touch! Kinneil have recently appointed the exciting conducting team of Chris Shanks and Raymond Tennant for the next contesting season. Anyone interested in any of the positions, can apply in strict confidence to Band Secretary Robert Doherty at robertdoherty@blueyonder.co.uk or contact 07843 421826. Here is UNISON Kinneil Bands planned route for the Fair ‘Een on Thursday 29th June 2017. We hope to see all our friends, family and supporters in Bo’ness this week to help celebrate the best day of the year!!! Depart from Bandhall at 7:30pm in Linlithgow Road marching onto Baker Street then onto George Street. Embark onto bus to travel to Gauze Road entrance at Kinglass Drive, exit bus, and form up in Kinglass Drive and proceed to march to the home of Queen Elect. Band marches back up Kinglass Drive and returns to Gauze Road and onto bus to bus terminal at Dawson Place, exit bus and band march onto Baptie Place to the home of the Champion. After playing here the band will then walk via path linking Baptie Place to Liddle Drive to the home of Sceptre Bearer. Band will get back onto bus to travel to Corbiehall, exit bus at Salvation Army Hall in Corbiehall, will march proceeding west to Avon Place to the home of Fairy. Back onto bus and proceed to the west end of Livingston Drive and exit bus band will then march to Kinneil Bowling Club which we hope to reach at around 9pm. After playing in the Kinneil Bowling Club the band will re-assemble in Castlehill (cul-de-sac of Amulree Place) marching onto Deanfield Road heading east, walk through the cemetery and reassemble in Dundas Street onto Linlithgow Road and back to finish at the band hall at around 9:45pm. UNISON Kinneil Band are delighted to announce that Chris Shanks has been appointed as the bands new resident conductor, with Raymond Tennant being appointed to the post of Musical Director. The band currently have a vacancy for an Eb Horn, Solo Cornet and Percussion player. If you are interested in any of the positions, then please feel free to apply in strict confidence to Band Secretary Robert Doherty at robertdoherty@blueyonder.co.uk or contact 07843 421826. 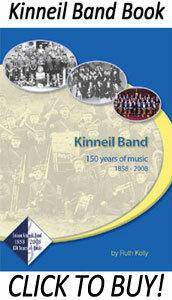 Kinneil Band (Scottish Championship Section) are seeking applications for the position of Resident Conductor/Musical Director (dependent on experience and ability). We are an enthusiastic, friendly and hard working group of musicians with a strong community focus. Rehearsals are on a Monday and Thursday evening (7.30 – 9.30pm), based in Bo’ness in central Scotland which is in close proximity to the M9 and M8 motorways. We also have a thriving Youth Band section. The band participate in the majority of the Scottish brass band contests (and the Spring Festival in Blackpool) as well as a number of concerts throughout the year and also local engagements. If you think you might be the person to take the band forward and are interested in the position please apply in strict confidence to Robert Doherty (Band Secretary) with a resume detailing your musical background and your conducting experience to date. Robert’s email address is robertdoherty@blueyonder.co.uk or contact 07843 421826. 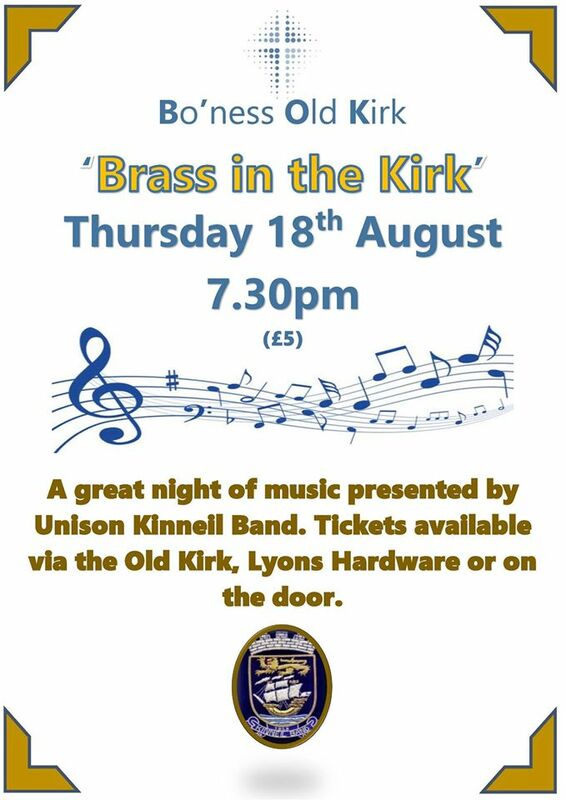 The Unison Kinneil Band are presenting ‘Brass in the Kirk’ on Thursday 18 August at 7.30pm in the wonderful setting of Bo’ness Old Kirk. Tickets are £5 (proceeds towards the work of the church) and are available via the Old Kirk, Lyons Hardware or on the door on the evening of the concert. We’re delighted to be presenting such a great evening of music in a wonderful church and hope to see you all there –help us spread the word! UNISON Kinneil Band rounded off the 2015-2016 season by performing at this year’s Bo’ness Fair. Luckily we missed most of the rain and it was great to see all our friends out supporting the band and the children on the ‘Best Day of the Year’. As tradition dictates, the band announces our Player and Bandsperson of the Year Awards on the Fair ‘Een. The Player of the Year Award goes to the player who has performed at the highest of standards not only on the contest stage but in the band hall over the course of the year. The award was chosen by the bands Musical Director, Craig Anderson, and the UNISON Kinneil Band Player of the year is Lauren Robb. Lauren is the band’s Principal Cornet player and has led his section with some outstanding solo and sectional performances throughout the year. The Bandsperson of the year was set up to recognise the member of the band whose efforts outwith playing have benefited the band most. The award is voted for by the members of the band and this year’s winner is Billie-Jane Skene. Thanks to all our supports, friends, players and committee members for a fantastic year – we look forward to seeing you all at our Brass in the Kirk Concert held in Bo’ness Old Kirk on Thuesday 18th August. 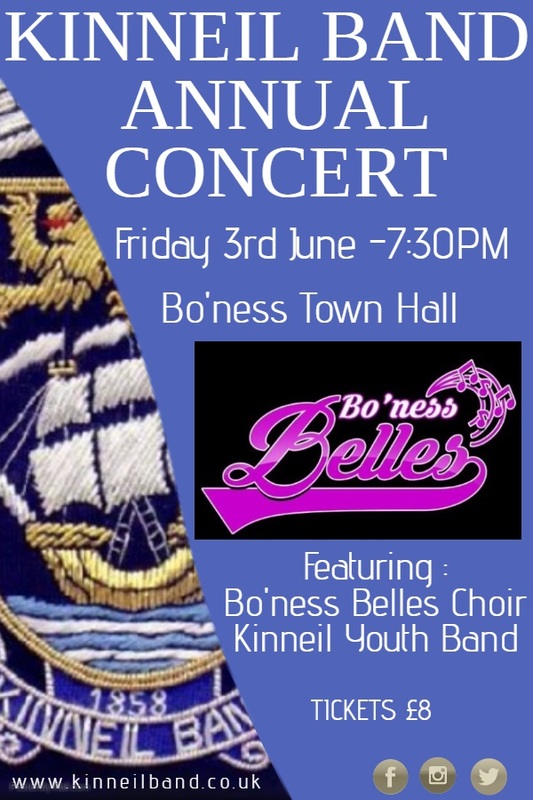 UNISON Kinneil Band is delighted to welcome the wonderfully talented Bo’ness Belles choir to our eagerly anticipated Annual Concert which is being held in Bo’ness Town Hall on Friday 3rd June. The Bo’ness Belles are a volunteer group of singers and were founded in 2013. The Belles visit care homes, sheltered housing establishments and local community groups to sing and raise valuable funds for local charities and have raised thousands of pounds over the last three years. The Annual Concert will also feature the exceptionally talented children of the Kinneil Youth Band who continue to grow in numbers and have enjoyed another busy but successful season. UNISON Kinneil Band have enjoyed an incredibly successful year on the contest stage which culminated in securing a top 5 finish at the First Section National Finals of Great Britain in September and safeguarding Championship Section status at the recent Scottish Championship competition which was held in March. This jam-packed evening of music making promises something for everyone. Tickets are on-sale now priced at only £8! Have a Kinneil Christmas this Year! UNISON Kinneil Band will be hosting a spectacular Christmas concert event that is being held in the beautiful setting of Bo’ness Old Kirk at 7:30pm on Thursday 17th December. We are going to be joined by the wonderful children of Kinneil Primary School Choir who will be performing some classic Christmas numbers that we are sure everyone will be dying to join in with. Our very own Youth Band will be making an appearance on the evening too! Tickets for the Christmas spectacular concert are priced at only £5 and we are sure you will leave the night full of Kinneil Christmas spirit! 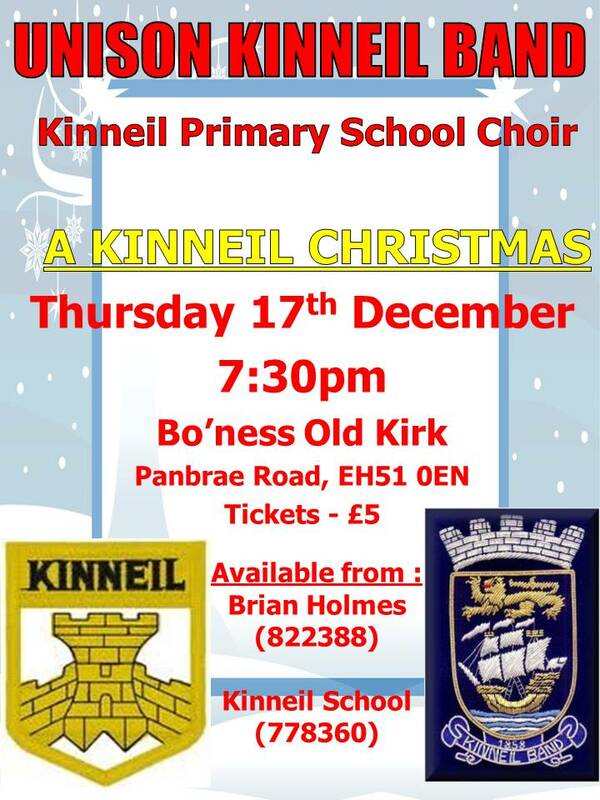 Call Brian Holmes on 01506 822388 or Kinneil Primary School on 01506 778360 to secure your tickets.